A team of Israeli, French and Swiss biologists have discovered how a strain of the bacterium Halomonas known as GFAJ-1, manages to survive in California's Mono Lake despite arsenic levels that would kill most other living things, according to a new report in Nature, due to the differences in the ion bonding angle between proteins in the bacteria and arsenate when compared to phosphate, which results in weaker bonding with the arsenate and a preference for phosphate. Phosphorus is one of six chemical elements that have long been thought to be essential for all life on Earth. The others are carbon, oxygen, nitrogen, hydrogen and sulfur. Phosphorus chains are the backbone building block of DNA and its chemical bonds, particularly in a molecule known as adenosine triphosphate, the principal means by which biological creatures store energy. An arsenic-eating bacterium offering hope for life living on alien worlds was announced by NASA scientists in January of 2010. As reported then in the journal Science, a team led by Felisa Wolfe-Simon of the NASA Astrobiology Institute in Menlo Park, Calif., who has been conducting research at Mono Lake California for years and led the experiment, had discovered an "alien life-form" on Earth: bacteria that replaced a key building block in DNA –phosphorus–with arsenic. "Biological dependence on the six major nutrient elements carbon, hydrogen, nitrogen, oxygen, sulfur, and phosphorus is complemented by a selected array of other elements, usually metal(loid)s present in trace quantities that serve critical cellular functions, such as enzyme co-factors. There are many cases of these trace elements substituting for one another," reported the NASA study. "However, there are no prior reports of substitutions for any of the six major elements essential for life. Here we present evidence that arsenic can substitute for phosphorus in the biomolecules of a naturaly-occurring bacterium." 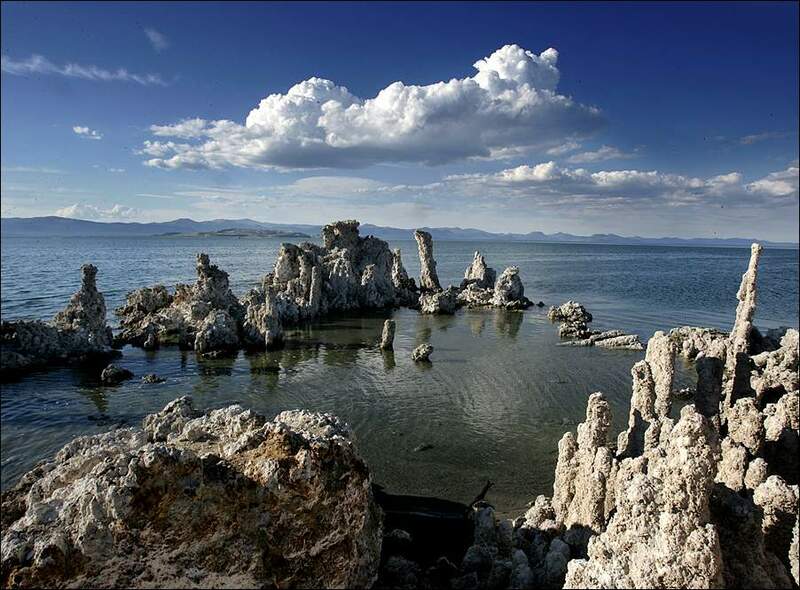 The new research essentially counters the NASA-supported 2010 finding that the Mono Lake bacterium was able to replace phosphorus in its DNA with arsenic, making it the only known form of life able survive without the six basic elements.To find out how GFAJ-1 is able to survive in such a toxic environment, the research team studied four types of bacteria, including GFAJ-1, specifically focusing on the bacteria's phosphate-binding proteins. Two of the bacteria types were resistant to arsenate (a combination of oxygen and arsenic), while the other two were sensitive to it. All four bacteria were placed in containers with identical amounts of phosphate, but differing amounts of arsenic, and allowed to sit for a full day. The researchers wanted to see how adept the bacteria were at differentiating between the two. All five sample types were then examined to see how much of the arsenic managed to bind to the proteins: the researchers found that all five showed a preference to binding with phosphate. One bacterium in particular, GFAJ-1, displayed a 4,500-fold preference. To better understand why the proteins bound more easily to the phosphate, Nature reports that the team took a closer look and found that different shapes of the phosphate and arsenate ions created a difference in the bonding angles with the proteins. The phosphate angles are closer to the optimal 180 degrees than the arsenate, allowing them to bond more easily. GFAJ-1's tendency to let phosphate in, while keeping arsenic out, is explained. While nature has been able to engineer substitutes for some of the other elements that exist in trace amounts for specialized purposes — like iron to carry oxygen — until now the NASA Mono Lake claims, there has been no substitute for the basic six elements. Arsenic sits right beneath phosphorus in the periodic table of the elements and shares many of its chemical properties -a chemical closeness is what makes it toxic, Dr. Wolfe-Simon said, "allowing it to slip easily into a cell’s machinery where it then gums things up, like bad oil in a car engine." In an earlier paper in The International Journal of Astrobiology, Felisa Wolfe-Simon and Ariel Anbar and Paul Davies, both of Arizona State University, predicted the existence of arsenic-loving life forms. According to the article in Science, a bacterium known as strain GFAJ-1 of the Halomonadaceae family of Gammaproteobacteria, proved to grow the best of the microbes from the lake, although not without changes from their normal development. The cells grown in the arsenic came out about 60 percent larger than cells grown with phosphorus along with large, empty internal spaces. By labeling the arsenic with radioactivity, the NASA Astrobiology researchers concluded that arsenic atoms had taken up position in the microbe’s DNA as well as in other molecules within it. It was inconclusive, however, that there was arsenic in the backbone of working DNA. The new studies, also published in Science, found that the bacterium did in fact grow in the conditions described in the 2010 study, but when the amount of phosphorous was reduced even further than in Wolfe-Simon's experiments, GFAJ-1 grow came to a halt. University of British Columbia biologist Rosemary Redfield writes in the new study, no signs of arsenic could be found in GFAJ-1's DNA. Other follow-up studies concluded that the arsenic-loving extremeophile does need phosphorous to grow, but shockingly tiny amounts of it. Wolfe-Simon, now with the Lawrence Berkeley National Laboratory, stands by her findings according to National Geographic. The new paper, she said, shows only that the arsenic doesn't show up in the DNA, not that the organism never uses it.